Pink Lace Rosetta Stone is a beautiful material that comes from Durango, Mexico. The red to pink areas tend to cut a little hard and the lighter areas are softer. This can present a challenge when cutting cabochons. However, Pink Lace Rosetta Stone cuts such pretty stones, the extra work is worth the effort. Pink Lace Rosetta Stone cuts with silicon carbide or diamond wheels and polishes with tin and cerium oxide or diamond. It is usually formed in nodules and has transparent, or translucent portions. 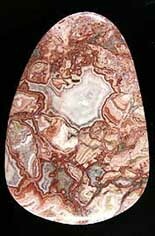 As with all of the other species in the quartz family, Pink Lace takes a high polish with cerium oxide.